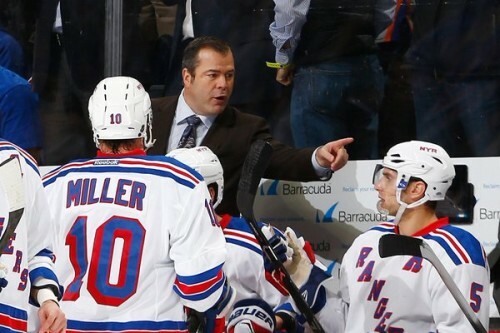 Home/Featured/Should The New York Rangers Wear The White Jerseys At Home, Again? NHL teams wore their white jerseys on home ice and dark uniforms on the road from 1970 up until the 2002-2003 season. The NHL then reverted back to having their clubs wear the dark sweaters on home ice, which teams originally did dating back to the mid 1920’s. Though, recently a few teams have chosen to wear their white sweaters in front of the hometown fans…including the New York Rangers. The Rangers broke out the road white jerseys for their game against the Anaheim Ducks last night, as a part of a theme for the team’s last home game before the league wide winter break. So, the Garden Faithful witnessed a white Christmas in New York, where it was a “winter white” night at Madison Square Garden. New York even came through with a much needed victory in overtime off of a Mats Zuccarello power play goal. It was quite a site seeing Zucc and the rest of the team celebrate in the crisp “winter whites” after the goal — with the rest of the Garden crowd jumping for joy in the background. For some Rangers fans — it brought back memories. All-time greats such as Brian Leetch, Mark Messier, Ron Greschner and Wayne Gretzky are remembered for dawning the white jerseys at the Garden. In fact, the Rangers wore the “old” home uniforms the last time they hoisted the Stanley Cup back in 1994, on home ice. Watching New York wear the whites at the Garden again last night, and win, brought back a certain atmosphere. The Rangers’ uniforms are already one of the better looking jerseys in the league, so seeing them take the ice at home in the fresh “winter whites” was re-energizing for the fans and perhaps players — a nice change of pace, especially for a struggling Rangers team in need of one. So, should the Rangers go back to wearing the white jerseys at home? The Rangers wearing white at home has a sleek look to it. I think all the Original Six franchises should go back to wearing the whites at home for a majority of the games. Keep in mind, even when the Broadway Blueshirts did have the white uniform as the official home jersey — they still wore the road blues on home ice from time to time. In my mind, that once and a while process, of wearing the blues at home, makes the Blueshirts’ classic royal blue jerseys that much more significant to both the organization and the fans.